After a desperately weak post-crisis performance even by CESEE standards, the Serbian economy finally had a good year in 2018. 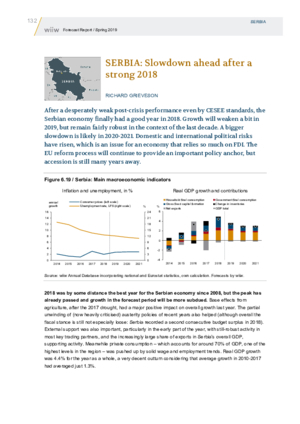 Growth will weaken a bit in 2019, but remain fairly robust in the context of the last decade. A bigger slowdown is likely in 2020-2021. Domestic and international political risks have risen, which is an issue for an economy that relies so much on FDI. The EU reform process will continue to provide an important policy anchor, but accession is still many years away.